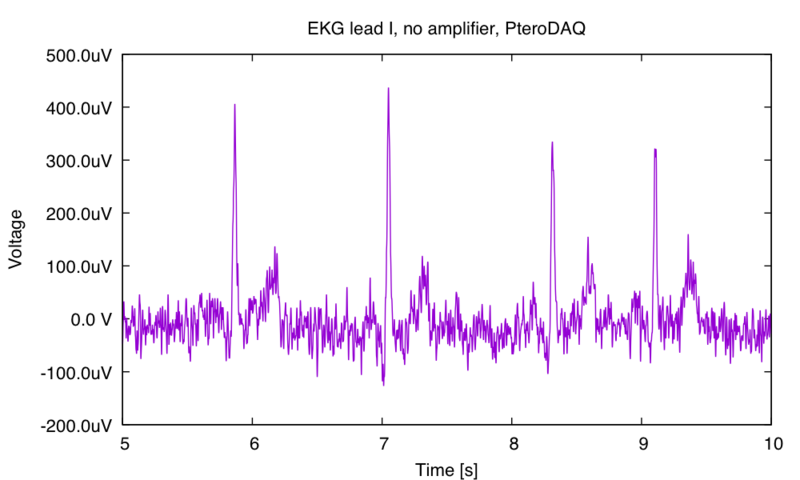 I’ll have to make some measurements later this week to see how large the common-mode noise on the EKG signals really is. Of course, it is likely to be highly variable, depending on the electrodes and the wiring to them, but ball-park estimates would be useful. If the AC common-mode voltage is only ±1 mV, then the Blinky EKG could probably work even with very poor common-mode rejection in the instrumentation amp, and building it out of op amps and discrete resistors is feasible. So today I tried measuring the common-mode signal. As it turns out, I had built an EKG amplifier on the protoboard that had a split Rgain resistor (two 12kΩ resistors in series). The node between the 2 resistors should be at (Vp+Vm)/2, the common-mode voltage. That node was fed to a unity-gain buffer, so I tried measuring the AC common-mode voltage. I did this with two different tools: my Fluke 8060A multimeter (which measures RMS voltage) and my BitScope Pocket Analyzer, which can measure peak-to-peak voltage. With the multimeter, I saw about 20–35 mV RMS, and with the BitScope I saw 90–130 mV peak-to-peak (depending on where my arms were relative to the wires to the electrodes). 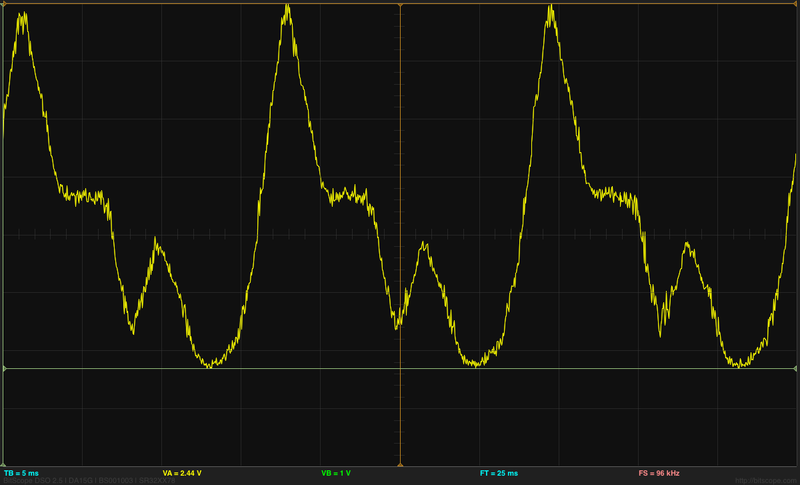 Trace of common mode noise recorded by the BitScope Pocket Analyzer, at 20mV/division. The fundamental frequency of the noise is 60Hz. Sorry about the black background—the manufacturers are promising a white background as an option in some future release of the software. Maybe they’ll add some labels for the x and y tick marks at the same time! If I take the leads off the electrodes and clip them all together, then the common-mode noise drops below the level that the BitScope can measure (its noise floor is about 10mV). The multimeter also has trouble, reporting values from 0.05mV to 1.5mV. 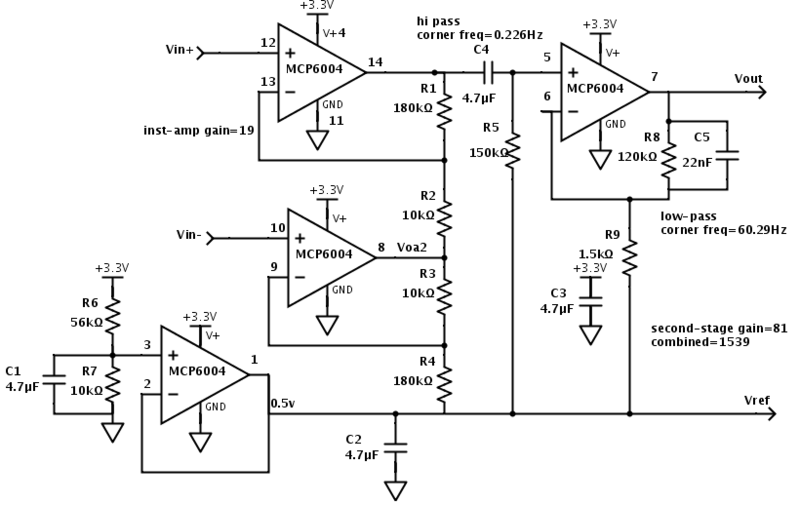 If I put a 3.3MΩ resistor between the two signal leads, and connect one of them to the Vref lead, then the multimeter reports about 13–20 mV RMS and the BitScope around 80–90 mV peak-to-peak. The common-mode problems are definitely coming from the wiring to the electrodes. 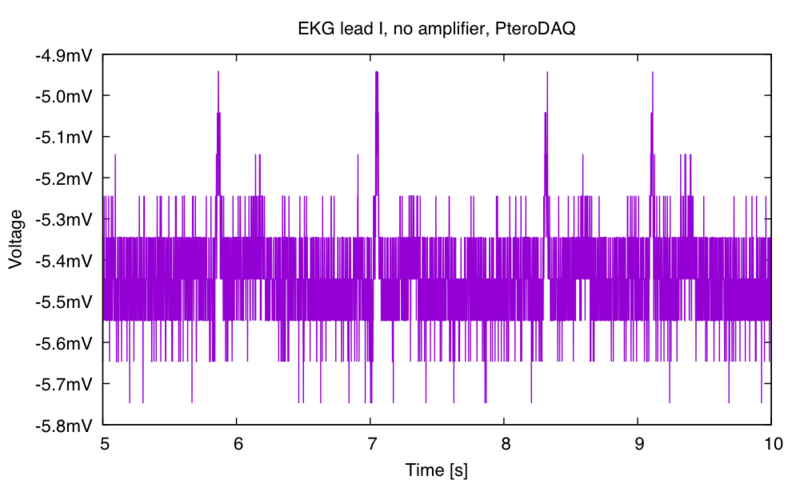 With 130mV peak-to-peak common-mode voltage and a common-mode gain of 0.02 or 0.04, we’d have 2.6–5.2 mV of common-mode noise at the output of an instrumentation amp made with discrete resistors and op amps. 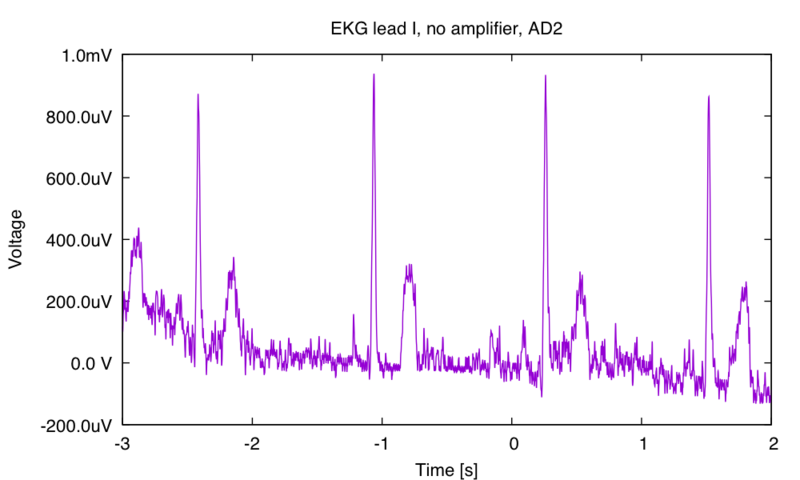 If the gain of the amplifier were around 6.6, we’d have a peak-to-peak signal of about 6.6 mV for the EKG signal, and the details of that signal would be buried in common-mode noise. If we got lucky with the resistor values and they matched better than the specs claim (which is actually fairly likely), then the Blinky EKG would sort-of work with discrete op amps—as long as the 60Hz noise is no worse that what I saw. Many people are likely to be in electromagnetically noisier locations than my room, so the common-mode noise is likely to be much higher sometimes, and even with lucky matching of the resistors the common-mode signal is likely to swamp the real signal. 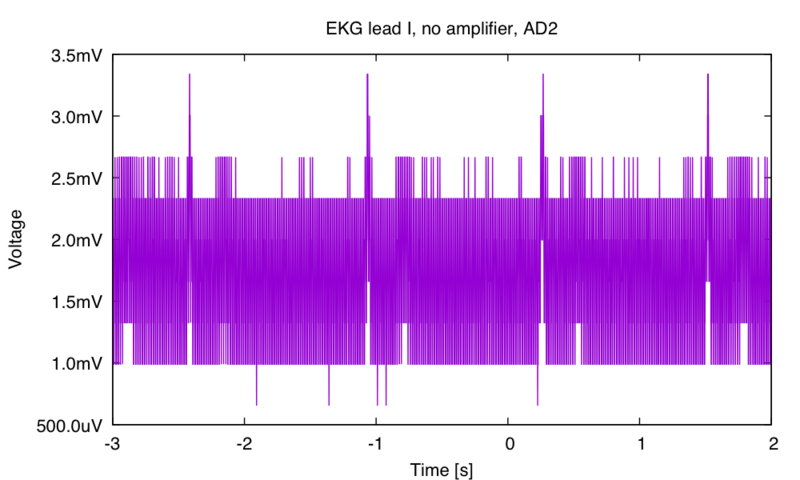 Thus I have confirmed that an integrated instrumentation amp is needed for the Blinky EKG, and there is no point trying to design one using discrete resistors and op amps.